His Holiness the 14th Dalai Lama, please speak out against the brutal dog meat trade. Home / Blog / His Holiness the 14th Dalai Lama, please speak out against the brutal dog meat trade. His Holiness The Dalai Lama is a highly revered spiritual leader of Tibet and a human rights activist known throughout the world. He is the best known Buddhist leader of today and his teachings on practicing peace and compassion are followed worldwide. He was born on 6 July 1935, to a farming family, in a small hamlet located in Taktser, Amdo, northeastern Tibet. The Dalai Lamas are believed by Tibetan Buddhist followers to be manifestations of Avalokiteshvara or Chenrezig, the Bodhisattva of Compassion and the patron saint of Tibet. Bodhisattvas are believed to be enlightened beings who have postponed their own nirvana and chosen to take rebirth in order to serve humanity. We would like His Holiness to speak out against the practice of eating companion animals and the cruelty involved in the trades, and to share the Buddha’s teachings on compassion to animals to his followers and to the world. 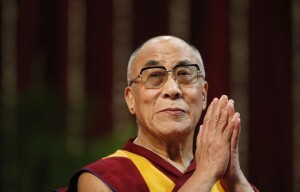 Please call, email and write to His Holiness the Dalai Lama today! You can use our sample letter below or use your own words. Your Holiness, you teach that all violence is injustice, and we ask Your Holiness, therefore, to speak out against the violence that is perpetrated daily in South Korea within the dog meat trade, where animals are subjected to barbaric acts of torture and unimaginable suffering. We respectfully ask Your Holiness to stand up for the animals in South Korea, and in other Asian countries where dogs are consumed, and also to publicly voice support in favor of ending the dog meat trade. We ask Your Holiness to stand with KoreanDogs.Org, and to share Your Holiness’s condemnation of this cruel trade. We ask Your Holiness to educate people that a compassionate society benefits everyone within it. An online petition calling for your support in ending the horrendous dog and cat meat cruelty is in progress: https://www.change.org/p/his-holiness-the-14th-dalai-lama-his-holiness-the-14th-dalai-lama-please-speak-out-against-the-brutal-dog-meat-trade Thank you in advance for your response. THESE SCUMBAGS ENJOY TORTURING DOGS AND CATS. THEY ATE GOD’S SENTIENT CREATURES THEY ARE NOT BORN TO BE TORTURED! #INHUMAN SCUM. You can see the terror in the dogs faces they are tortured to death in front of their cagemates. Jesus h Christ WHAT SORT OF A MIND COULD DO THIS ! IT’S GOT TO STOP NOW ! Stop ermee viezen dierenbeulen bah wat walgelijk zijn jullie zeg blijf met je poten van die arme beestjes af je hoort ze met liefde te behandelen en als stuk vuil dat doe je maar met je eigen maar niet bij dieren hou der mee op ik kan jullie niet uitstaan jullie vieze dierenhaters?????? Myself and millions of vegans around the world are waiting for the day that no animal is enslaved, abused, raped or murdered. We all can do our part by leaving animals off our plate, don’t visit zoos or circuses or pay to have any animal entertain you. Do buy leather or fur products and refuse to buy anything that uses or exploits animals for monetary gain. Cow’s, chickens, pigs, lambs, sheep, camels, they all need a hero too and deserve to live as much as any dog or cat. Please be a hero, stop using animals, go vegan. Go to the dailia Lama facebook page, put a can you help, he goes on about compassion, a I have put commemts daily they get taken off but will still put them on please. I’ve just sent him an e-mail….